I've never been a fan of Emily Dickinson. In truth, I found her to be intimidating and I limited my contact with her work with what I absolutely could not avoid in literature classes in High School and at College. 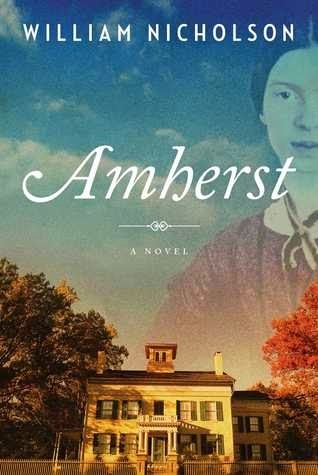 Still, the idea of this book intrigued me, probably because Emily Dickinson seemed to be a secondary character against her brother's love affair. And she is a secondary character--the story shifts between the 19th century relationship of Austin and Mabel and the 21st century relationship of Alice and Nick. Emily is very, very much at the edge of things--sort of. Before I go with my thoughts on the meat of this book, I do have to credit it with this: I have a new appreciation of Emily Dickinson. Now, I wish I had paid more attention to her work when I encountered it in my classwork or had sought her out on my own. Nicholson plays into the Myth (literally) of Dickinson and uses it to his advantage. And that is the extent of positive things I can say about this book. I found both plots in this book hard to stomach. Nick and Alice almost made me ill--Alice is a young-ish woman who "falls under the spell" of an older man and I never understood why. Perhaps Nicholson was trying to create a character in the mold of the "Romantic Anti-Hero"--think Rochester or Heathcliff. If that is the case, he failed. Nick is nothing more than misogynist in the midst of a midlife crisis and Alice is nothing more than his most recent prey. When it comes to the plot involving Austin and Mabel, I do understand that Nicholson is bound by the facts of what actually happened--Mabel and Austin were both married to others and began an extramarital affair. Austin's wife was understandably not pleased with this development, but Mabel's husband was unusually supportive of it. Mabel's husband, David, it painted by Nicholson as an enlightened husband, when it is clear to the reader that he is nothing more than a pervert. I disliked both characters immensely. Mabel is self-centered and arrogant, almost to the point of comedy. She spends a great deal of time whining that Austin's wife, Sue, is being very unfair by not accepting Austin and Mabel's affair. Really? I mean, really? Austin is, like Nick, a man who spends his time feeling sorry for himself because the world does not bow down at his feet. He doesn't really seem to have anything going on other than a loveless marriage--and it seemed to me that he was the one who killed the love in that relationship--and the great unfairness that he can't marry his mistress, yet he is strangely okay with his mistress's husband watching their trysts. Really? I mean, really? And then there is Emily. This book is touted to be about her...and sometimes it is, but not really when it makes sense to be about Emily. Nick and Alice have a number of post-coital chats about her poetry and she does sort of float in and out of Mabel and Austin's story, which is appropriate, but Nicholson tries to put more weight on her than he can support in this story. In truth, Emily really only became important in their relationship after she died and Mabel set out to publish her poems. Instead, Nicholson tries to shoehorn Emily into parts of the plot where she really doesn't belong and then she sort of just leaves her hanging without any explanation as to why she's important to the story at that point. If that were not enough, her ghost shows up in a couple of supernatural scenes that are completely unlike anything else in the book. I read in the afterward that many of these characters show up in Nicholson's earlier books. I suppose an argument can be made that a reader's view of this book would be different if they had read all his books. However, I doubt it. The problems from this book don't rise from unexplained backstory--they result from poor structure and character development. I just can't recommend this book to anyone, which is too bad as it did awaken an interest in Emily Dickinson for me. And, now, I'm off to read some poetry.